It can be extremely frustrating to be refused a job or promotion because of your accent or due to the fact that your name sounds too ethnic. Although United States laws forbid any form of national origin discrimination, it still is one of the discriminatory employment practices quite common in this country. If you feel that you’ve been mistreated because of your national origin or a birthplace, contact a NYC employment discrimination lawyer today. When an individual is treated differently because of the country in which they were born, their ancestry, culture, linguistic characteristics or accent, they have been discriminated against on the basis of their national origin. An employment action based upon any of these factors constitutes illegal discrimination. While people often use the term “national origin” interchangeably with the word “race,” this is an incorrect use of the term. National origin specifically refers the country where a person or their ancestors were born, as well as that person’s physical/linguistic traits, family ancestry and cultural background. National origin discrimination in the workplace occurs when an employer treats an employee differently than other employees because of that employee’s perceived or actual national origin. If you experience any national origin discrimination in your workplace, you should consult with a workplace discrimination lawyer. Country of Origin: Harassing or otherwise discriminating against an individual because she is from a particular country. For example, you are harassed because you are Iraqi or are paid less than other workers because you are Mexican. Physical or cultural traits and clothing: Harassing or otherwise discriminating against an employee because of an accent or dress associated with a particular country of origin. For example, you are not hired because you wear traditional clothing and have an accent believed to be from Somalia. Perception: Harassing or otherwise discriminating against an employee because of the perception or belief that a person is from a particular country, even if the person is not. For example, even though you are from China, you are not hired because the hiring official believed that you were from Vietnam. Association: Harassing or otherwise discriminating against someone because of the employee’s association with a person from a particular country. For example, you are harassed because your husband is originally from Afghanistan. Language requirements: Creating an English-only rule even though it is unnecessary for the function of a business. Call an employment discrimination attorney at The Law Office of Yuriy Moshes, P.C. and get free consultation. For many people living and working in the United States, English is not a first language. One reaction to this diverse workforce is the implementation of English-only rules requiring employees to speak only English on the job. However, full time English-only rules are only lawful if established for nondiscriminatory reasons, and promote the necessary operations of the business. Otherwise, it could be deemed discrimination on the basis national origin. This is because an individual’s primary language is often an essential national origin characteristic. An English-only rule that is in effect only at certain times is permissible when the employer can demonstrate a business necessity for the rule. An example might be a paid speaking position, such as a customer service representative, where the employer’s customer base is predominately English speaking. English-only rules applicable in limited circumstances may be acceptable, as long as they are not a pretext for discrimination based on national origin. If you have questions about English-only rules in your workplace, or if you believe that you have suffered national origin discrimination on the job, contact a NYC workplace discrimination lawyer to discuss your situation and protect your legal rights. – Disparaging comments about your national origin. If something like this happened to you, you should contact an employment discrimination attorney. What Laws Govern National Origin Discrimination in the Workplace? Title VII of the Civil Rights Act of 1964 is a federal law that protects employees from discrimination based upon national origin. Unfortunately, Title VII only applies to businesses employing 15 or more people, which exempts a large number of small businesses. Fortunately, the New York State Human Rights Law (“NYSHRL”) and the New York City Human Rights Law (“NYCHRL”) also forbid any form of national origin discrimination in the workplace and protect employees working for businesses employing four (4) or more people. If you are discriminated against due to your national origin, know that you are protected under the law. 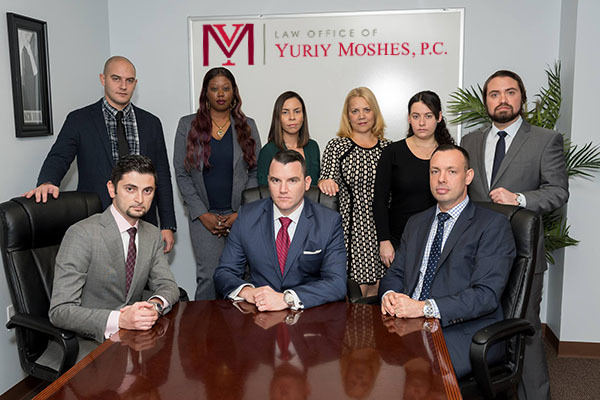 Contact the job discrimination lawyers at the Law Office of Yuriy Moshes, P.C. to learn your options. What Should I Do If I Face National Origin Discrimination in the Workplace? Collect any national origin statements made by the employer. If the statement comes in written form such as in a letter or an email, keep it. If the evidence is based on an oral statement, do your best to remember it word-for-word and write it down as soon as you can. The best practice in such a situation is to type the statement electronically in some form that has a time stamp such as a text message so your discrimination attorney can prove the time and place in court. Photograph any discriminatory images, displays, or cartoons that indicate possible national origin discrimination. Research your employer’s complaint procedure and complain about the discrimination pursuant to that procedure. You have to give your employer a chance to fix the situation and put an end to the national origin discrimination. Make sure you follow your employer’s complaint procedure, if there is one, and report the discrimination to the correct person. It is always best to put your complaint in writing. If you’ve only complained verbally, make sure you follow up in writing confirming the fact that you complained and reiterating the subject of that verbal complaint. Furthermore, provide the person to whom you’re complaining with copies of all the evidence you’ve accumulated. Remember, the employer doesn’t have to fire the person discriminating against you or inform you of the results of any investigation. They only have to make the discrimination stop. Keep records of all mental health treatment that you received as a result of the national origin discrimination. An experienced employment lawyer can help you understand how the laws protect you against national origin discrimination. Job discrimination lawyers from The Law Office of Yuriy Moshes, P.C. work in the greater New York City area including all of its boroughs (Manhattan, Brooklyn, Queens, the Bronx and Staten Island) as well as Northern New Jersey, Long Island, and Upstate New York.